As an Iranian committed to help bring about secularism in Iran, it may surprise some people, that there have been many Shia clerics who have won my full admiration. Perhaps none more than Ahmad Ghabel, the Iranian Shia cleric and Islamic scholar who died yesterday at the age of 55. Ghabel was also the man who exposed the unreported mass executions in Mashad's Vakilabad prison. His life, dedicated to standing up to tyranny, deserves much more than this humble post. During the Iraqi invasion of Iran, Ghabel voluntarily went to the war front on several occasions. A mortar shrapnel piece lodged close to his spine, remained with him for the rest of his life which ultimately brought about his illness and demise. Ghabel's older brother, Abolghassem was martyred in the war and his other brother Mahmoud is recognised as a 'Jaanbaaz', meaning those who have survived the war but have serious debilitating injuries as a result of their participation in the war. In 1997, Ghabel was imprisoned for the first time after the revolution, the first of six imprisonments to come. In 2001 he spent 125 days in solitary confinement after his third arrest. 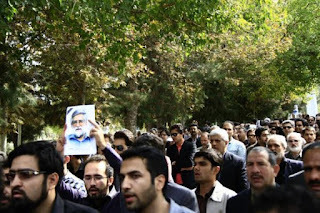 In 2009, and during the height of the post-election protests in Iran, Ghabel was arrested again on his way to attend the funeral of the dissident Ayatollah Montazeri. In 2010 he was taken to his trial with his feet and hands chained together but he said in his trial “I see nothing but splendour in these chains”. His heroic defence during his trial became a trial of the regime itself. Ghabel was given the rank of Ijtihad by Ayatollah Montazeri, which meant he could issue fatwas and answer religious questions. Of his most famous fatwas was that Islam does not make it mandatory for women to cover their face and hair, as well as his staunch opposition to stoning. Ghabel was laid to rest on Wednesday with hundreds attending his funeral while plain clothes security agents watched and filmed those who attended his funeral. Ghabel was a fearless man, a good man who did not stay silent when evil prevailed.